Kind, caring, considerate, thoughtful, supportive, loyal and fun would be the positives. But my bestie is pretty honest, so she also said I’m very direct, honest and annoyingly indecisive. In my trademark indecisive mode, I can’t choose one thing. I love blogging as I adore writing and recording memories of my gorgeous family. I’ve recently started blogging about my eldest daughter’s special needs, and I’ve been blown away by the support I’ve received from strangers online. But I’ve also been really delighted that I’ve been able to offer a bit of solace to others in a similar situation. And finally (told you I was rubbish at decisions), I love the friends I’ve made with other bloggers and the friendliness of the blogging community in general. Hollow following to boost stats. If you like what I post, follow me. If you’re just after followers and are playing games, please leave me alone. Be yourself. You are your unique selling point and being true to yourself, rather than imitating others, is what people will want to read. Our local garden centre – Van Hages. Because that’s what happens when you have kids, you start seeing garden centres as days out! This one has a mini farm, a miniature railway, gorgeous homewares, clothes from the likes of Joules and a café with delicious cake and caffeine. Oh and plants. What more do you need with small children? ITVBe. I literally love all the reality series they put on – TOWIE, The Real Housewives of Cheshire, Sam and Billie Faiers Mummy Diaries, Ferne Mccann, etc etc. If they broadcast it, I’ll binge watch it. My family (I’m counting them as one because I’m greedy). I know it’s a bit soppy, but I’d be lost without them. My kindle – what’s a beach holiday without a good book? When I was invisible by Dorothy Koomson. I have read all but the latest of Dorothy’s books and loved every one of them. Her stories always have really interesting characters, and the plots always have a bit of a twist. There’s usually something big that you want to find out, which keeps you turning the pages. They are true escapism. I’d have at least two hours for a long soak in the bath, a bit of pampering and getting glammed up. Then we’d go for a really nice meal where we’d have a good old uninterrupted chat. Then we’d go for cocktails and dancing and let our hair down a bit. Oh and if possible, could we have someone to get up with the kids the next morning, so that we could have a lie-in and not have to parent with hangovers. 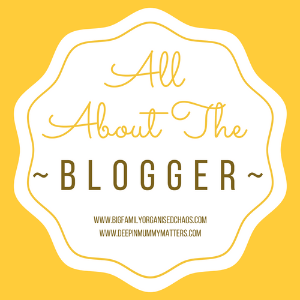 Thankyou for joining in All About The Blogger and for introducing us to Katie, I have read some of her posts previously, but its lovely to read ore about the person behind the blog.